This is as close as I'm ever likely to get to Malt Mill. Pathetic, I know, but part of being obsessive about tasting everything the best of the best is the train-spotter tendency. And at the moment, with The Angel's Share still fairly fresh in the public consciousness, there's a chance folk might know what I'm on about. 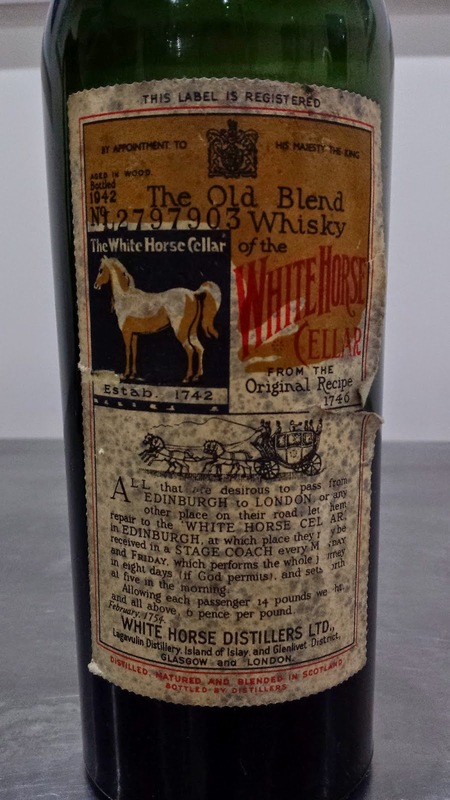 I'm told that at this date the malt component of White Horse would have included both Malt Mill and Lagavulin, and it seems, going by the taste, that the malt content was much higher than today's bottlings, and that the whisky was peatier too. For a whisky that has been in bottle for seventy years, this is really very smoky. Peat smoke, not wood char or coal smoke, and with some sweetness and a slight floral perfume. Very soft, of course. The palate is silky smooth, with a big initial hit of peat, shading into cigar smoke and fruit syrup. It is light bodied except in the finish, when it gets slightly grippy, before shading into a long salt/char/sandy aftertaste. It was a privilege to taste this fine drop, and be reminded that blends can - or could, in the past - be as good as or better than self whiskies. Excellent.